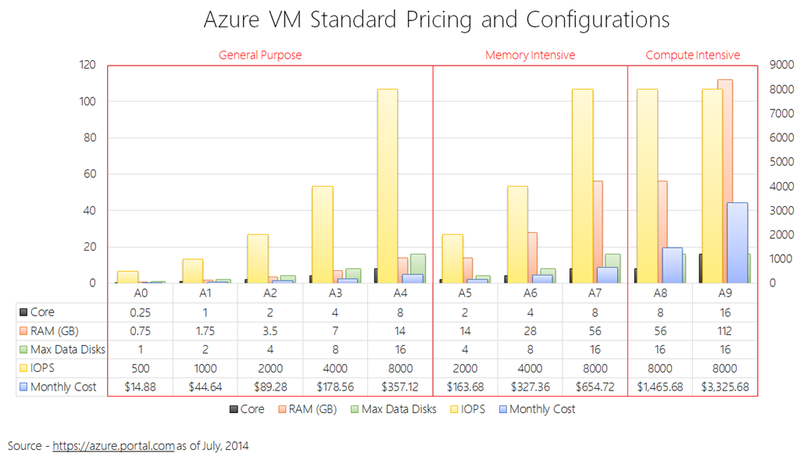 Microsoft Azure has provided two pricing schedules, Standard and Basic, and each has a set of configurations available for deploying a VM. This article provides a quick reference while highlighting important considerations for choosing a VM configuration. 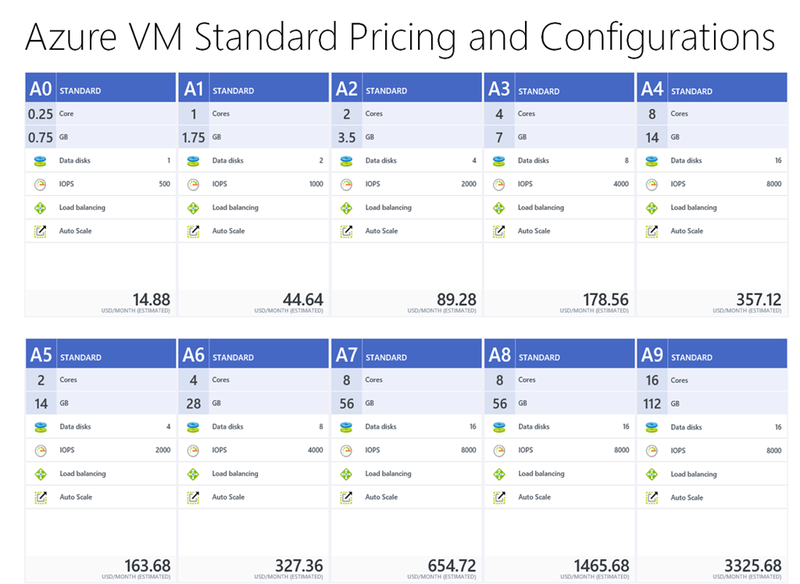 Microsoft Azure Standard pricing offers ten defined VM configurations available for deployment. As of July 17th, 2014, Azure portal (https://azure.portal.com in preview as of July of 2014) shows monthly costs from $14.88 for a simple general use A0 machine to $3325.68 for a compute power house of A9 as shown below. Each VM configuration is defined with the number of core (or virtual CPU in the context of a VM), RAM, maximal number of data disks attachable and IOPS. As highlighted in the following, the more capacities a VM configuration includes, the higher an associated monthly cost is. These ten configurations are developed for three types of employment. From A0 to A4, there is an across-the-board increase of all capacities from one set to the next. These configurations are intended for general purpose instances. A5 to A7 has significant combined capacities to run memory intensive applications, while A8 and A9 are with massive compute and storage capacities in additional to considerable IOPS for deploying those VMs hosting compute intensive workloads. Notice the presented pricing model is as dated and you should always check the source for the latest offerings. Basic and Standard pricings have the same A0 to A4 configurations of core, RAM and max number of data disks attachable. For instance, an A3 VM with either Basic or Standard pricing has a configuration of 4-virtual CPU configuration, 7 GB RAM and up to 8 data disks attachable as shown below. 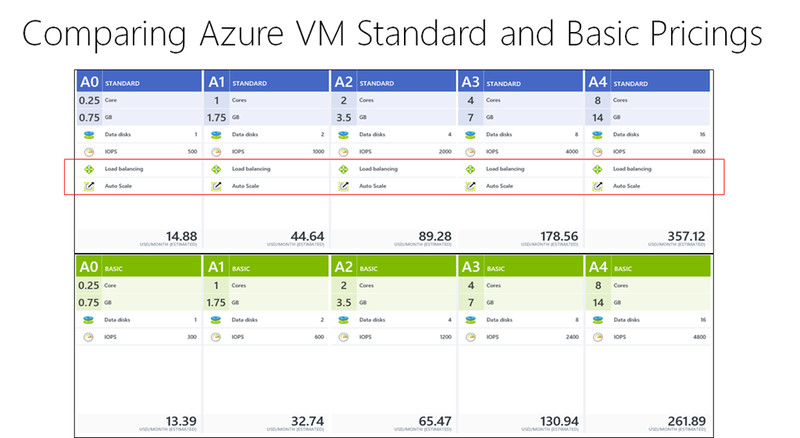 The significance of deploying a Azure VM with a Standard pricing is that load-balancing and auto-scaling are available, while those with Basic pricing do not include the two features as shown above. Essentially, Basic pricing is for deploying VMs intended for application development or triage, at the same time Standard pricing is for deploying VMs in a production setting where load-balancing and scalability may be critical for some applications. Microsoft Azure Infrastructure Services is an IaaS solution and a viable platform for managing entire application life cycle with agility and cost-effectiveness as proved by many case studies. For IT pros, Azure has offered a roadmap and Infrastructure Services as accelerator for advancing career in this cloud computing era. 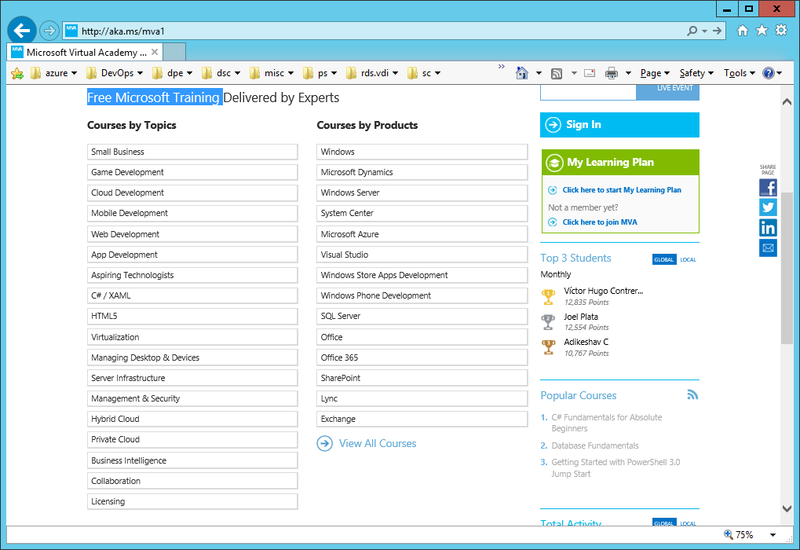 To learn Azure, Microsoft Virtual Academy (http://aka.ms/mva1) has provided a Microsoft Azure track to facilitate your learning. As you learn how to employ a VM in Microsoft Azure, assess your applications and deploy/test them to identify an optimal VM configuration. Do it. Sign up a Microsoft Account (http://outlook.com) if not already. You will need one to download trial software, access virtual labs, sign up Microsoft event, and consume Microsoft Virtual Academy content. Learn it. Register at Microsoft Virtual Academy (http://aka.ms/mva1), review Microsoft Azure track, develop and follow through your learning plan. Review it. For those interested in learning more, I recommend these posts (http://aka.ms/recommended). Subscribe it. Get he RSS feed of my blog (https://yungchou.wordpress.com/feed/) and follow me in twitter, (http://twitter.com/yungchou) as I publish Azure content regularly.